This past summer, I was the recipient of the Kevin Workman Foundation scholarship for a booth at San Diego Comic Con! I received the call back in February, so I had several months to prepare for the experience, but I really had no idea just how overwhelming it would be! I was incredibly honored to be selected by René, Brian, and Paul, who run the Kevin Workman Foundation in the name of their friend, a huge supporter of the arts. Not only does the foundation send a promising artist to SDCC (they're taking submissions now until January 15th! ), they also carry on Kevin's legacy with outreach programs with at-risk youth and bring them opportunities to express themselves and explore creativity. My booth setup for SDCC - it was 10' x 10' and my goal was to make it inviting and present a "gallery" to catch attendees as they walked by. I later flipped the layout to draw more people in. The KWF guys made sure I was as prepared as possible, making each step of the journey as painless as possible! Nothing really could've prepared me for how utterly overwhelming SDCC would be, though! When my boyfriend Taylor and I arrived, René took us for a "quick" tour (I'd later learn that it could take more than an hour to simply walk from one end to the other due to the sheer amount of bodies in that space! ), and I found myself skipping, clapping, and giggling as the huge nerd that I am - I'm at frickin' Comic Con! Taking a CAT nap under my table. I was SO wiped! SDCC was a real test of my endurance, though! I had not planned on getting over a sinus infection that week, so for the first two days of the con, I was completely exhausted and out of energy. Taylor would man the booth while I took cat naps under my table to reenergize myself (which turned out to be totally worth it. Also, bubble wrap works as a great pillow in a pinch!). I instructed Taylor to kick me awake if someone asked to meet me, haha. Some of the most memorable experiences from SDCC included getting to know the folks behind the Kevin Workman Foundation, and meeting people that knew Kevin and were excited to meet me, being the 4th recipient of this scholarship! I was truly honored to get to be a little part of that legacy. With the KWF crew at their fundraiser after a very long day of traveling and setting up my booth! Of course, it would be blasphemy for me to be at SDCC and not get to experience a little bit of waiting in line to meet someone I admire! 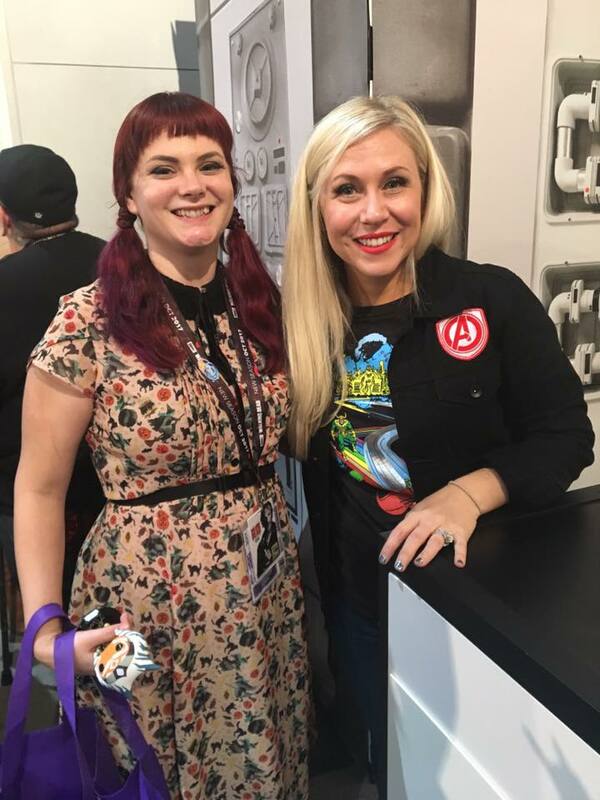 On Sunday, I took some time away to go meet Ashley Eckstein, voice of my favorite Star Wars character, Ahsoka Tano, and the lady behind Her Universe. I knew that Ashley liked Alice in Wonderland, so I brought her a print of my "Curiouser and Curiouser" painting, and had her sign a Funko Pop figure of Ahsoka, and sign a book for me. Getting to meet Ashley Eckstein, the voice of my favorite Star Wars Character, Ahsoka Tano. After five grueling days at SDCC, meeting hundreds of people (at least! ), Taylor and I were able to unwind a bit, so we enjoyed some more of San Diego (fun fact: I was born here! ), and visited the San Diego zoo as well as spent some time at the beach before we headed back home to Nashville. I'm so grateful for the experience given to me by the Kevin Workman Foundation - it was truly something I will never forget, and I'm so excited to see who they select for their 5th year with the KWF Scholarship!